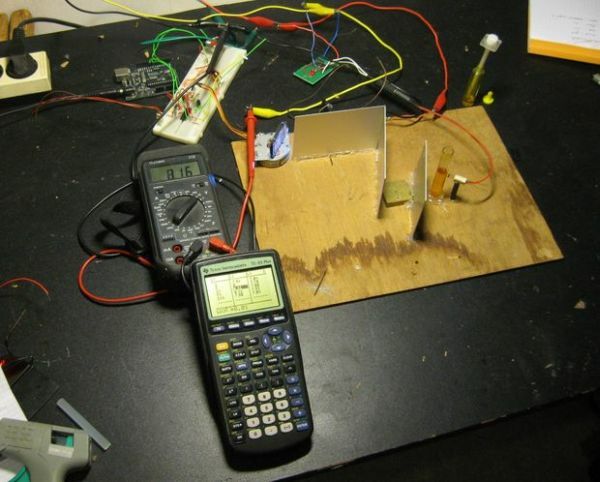 This instructable will explain how to build a fairly basic but working spectrophotometer out of easily sourceable parts. Of course, this device is nothing compared to a commercial spectrophotometer, but it will allow the builder to understand how such a device works. Huh? What are you talking about?! A spectrophotometer measures the amount of light that a certain sample absorbs. A beam of light passes through a prism or diffraction grating. Out of the resulting spectrum, a certain (range of) wavelength(s) gets selected by sending the light through a slit. The light passes through the sample and hits a detector. This way, one can build a “spectrometric fingerprint” of a certain sample that will depend on the molecules in the sample. I’d once again like to emphasize that this device is certainly not to be compared to a commercial system, but if you’re looking for a fun project that will enable you to learn something more about the workings of a spectrophotometer, this project is for you! Most parts are fairly easy to obtain. Step 2: Bring on the photons! First of all, we need a light source. Some possibilities include a small lightbulb or white LED. I installed both, so I could experimentally decide which one was best suited for my purposes. To construct the light source assembly, find some piece of plastic (or any other material, for that matter) and glue a bulb socket to it. For the LED, find some kind of connector (I cut off part of and old IDE-connector) and solder some wires to it. 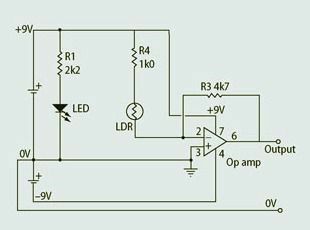 Also include a 2k2 resistor in series with the LED to limit the current. Glue the LED-connector somewhere near the bulb, and put in a LED. To be able to select a certain wavelength (the color of light depends on its wavelength) we first need to split the light into a spectrum. This can be accomplished by a diffraction grating. Since most people don’t have diffraction gratings lying around the house, a CD can be used as well. Take a look here for some background information. Note that a CD does not exactly produce an even spectrum, so it’ll give nowhere near as accurate results as with a “real” diffraction grating. Since we want to measure the absorbance of the sample at a certain wavelength (or in this case, range of wavelengths) we need to be able to select a certain part of the spectrum. This can be accomplished with a “slit”, i.e. a sheet of cardboard or metal with a narrow slit in it. To choose which part of the spectrum passes through the slit we can vary the angle with which the light hits the CD. I chose to use a stepper motor because it can be turned in discrete steps. The stepper motor can easily be driven with an Arduino board. Construct the bipolar stepper driving circuit found here and use the included Arduino-code “spectrostepper.pde”, the motor can be controlled by two pushbuttons. Construct the driver circuit. Then, add pushbuttons by connecting one leg of a 2k2 resistor (pull-down resistor) to ground, connect the other leg to one leg of the pushbutton AND to a digital input on the Arduino. Then, connect the other leg of the pushbutton to +5V from the Arduino. Connect the motor itself to a power source, load the sketch in the Arduino and drive the stepper! If everything went right, the motor should turn 1 step when you push a button; direction depending on which button you press.